Police Dash-Cam System Dash Hound System for Law Enforcement 10-8 Ready! The Dash-Hound Police Dash Cam System is the world's smallest Police in-car camera system. The dash dam can record in full HD! This camera system is totally self contained and you can install it yourself, save your department hundreds of dollars. This may have a revolutionary low price, but it also has allot of features. This Police dash-cam is the most affordable police car camera system in the world!, just 1199.99 for a complete system. This video system is 10-8 ready. Police Dash Cam. The video is just stunning. I made 3 calls last night and the facial recognition software made each face perfect. This is the best police dash-cam you can buy. So affordable! Now your'e ready to shoot evidence with HD video and you'll always be 10-8 video ready! The Dash Hound is a 2 in 1 police car camera system. I was searching on Google for a standard example of a police car camera video policy and came across the dash-cams for law enforcement. Police in-car audio/video equipment for officer safety, evidence collection, training and retention of the police dash camera systems video. It is the standard conforming policy of Police agencies using car video cameras to encourage the use of the in-car camera systems ability to not be turned off during a traffic stop. As soon as the light bar record activation is started, the officers wireless microphone should be turn on automatically. This ensure continually of the audio along side of the dash-cams video evidence. The pre-alarm also know as the pre-event recording gives you 1 minute of recording before the police car camera is record activated. This is a must have for your camera policy at your department. How In-Car Cameras Work to protect every American. A policy is a requirement after your buy/purchase the in-car equipment, any police department implementing a mobile car recording program must have the capability to review, copy, and log the video evidence collected in its vehicles. Managing Video Evidence from police car cameras systems is definitely the best role for a in-car camera policy. Getting protection of the evidence chain of integrity of the digital recorded media is essential in developing an in-car camera management plan. Police Body Cameras & In-Car Video Systems are vital to a police agency patrolling their local city. 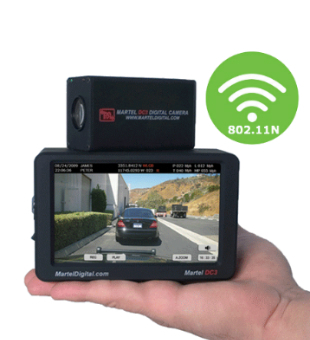 Martel has the most affordable police in car camera solutions as well as other dash cams system that are specifically designed for law enforcement. Our police department was searching for a patrol camera that we could outfit to our dash. We stumbled on this dash-cam that is 2 in 1 Hybrid police dash camera. My sheriff agency in Oklahoma tasked me to find a inexpensive police dash cam that we could use inside and outside the car. I found this in-car camera system called the Dash Hound. It works great and the video are HD. It has a automatic downloading cradle and can be activated by the light bar cable. Works awesome and totally affordable. We now have 11 of them.